Product #15897 | SKU VP83F | 5.0 (based on 1 rating) Thanks for your rating! The VP83F LensHopper Shotgun Microphone with Integrated Flash Recorder from Shure is a compact camera-mount condenser that provides detailed, high-definition audio with DSLR cameras and camcorders. It records 24-bit/48kHz WAV audio files to MicroSDHC cards, supporting capacities up to 32GB. The VP83F also features one-button recording and an intuitive operating menu, making it easy to use. 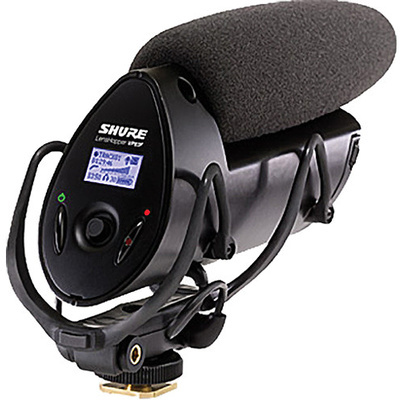 Additionally, an integrated Rycote Lyre shock mounting system provides isolation from vibration and mechanical noise. The VP83F LensHopper features a 60dB gain range, adjustable in 1dB increments, as well as a low-cut filter for adapting to different recording environments. Its lightweight, yet durable, metal construction provides dependability and long-life. The VP83F easily mounts to a standard-size camera shoe or a 1/4" threaded stand. The detachable 3.5mm cable connects to your camera's audio input, while the stereo headphone output allows you to monitor incoming audio. Despite its extensive functionality, the VP83F offers 10 hours of battery life on two AA alkaline batteries. A foam windscreen is included to guard against wind and environmental noise. The backlit LCD screen features complete activity monitoring from its home screen, including indicators for audio and battery metering, track information, headphone volume, mic gain, low-cut filter and remaining recording time. The VP83F has a five-position joystick that provides advanced user controls for headphone monitoring, low-cut filter and mic gain adjustments, track management, and playback.